Annette lost a shoe on our trip to Melbourne and so she got a new pair. She had wanted the 41 but they were sold out so she got the 42. I bought a new Ergon gadget to line up fitting the cleats and so used that. 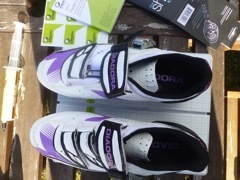 Also mounted new cleats on my shoes as they were worn. The Ergon mounting tool moved my cleats forward quite a bit. In both cases with new shields.